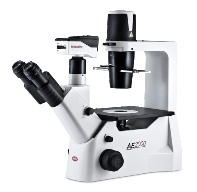 Motic's new AE2000 inverted microscope is the ideal instrument for routine live cell inspection in both educational and high grade applications and also makes the best choice for your tissue culture microscope due to its unique features excellent optics and affordable pricing.. Superb optical quality can be expected from a brand new optical series of both brightfield and phase contrast lenses from Motic's proven CCIS Infinity Optical System. 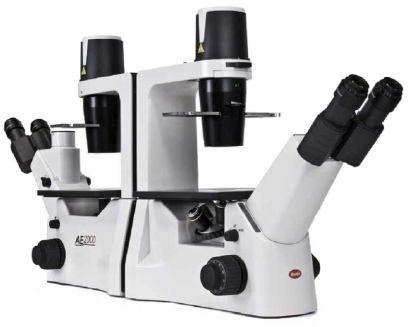 Choice of Binocular, Trinocular and Binocular Ergo heads. 10x, 12.5x and 15x widefield eyepieces are available as are brightfield or phase contrast objectives 4x, 10x, 20x and 40x. A phase contrast slider system is used for convenience and flexibility and choice of condenser is available depending on use. 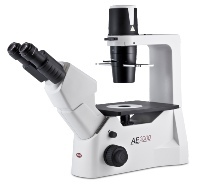 The AE2000 can be supplied with either Halogen or LED lamp unit depending on preference. 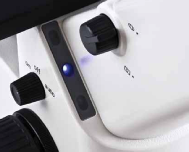 A 'Sleep Mode' device using an IR sensor detects when the operator has is away from the microscope and automatically turns off the illumination after 15 minutes. When the operator returns to the microscope the sensor restores the power. A mechanical stage, specimen holders, cameras and adapters complete the series.